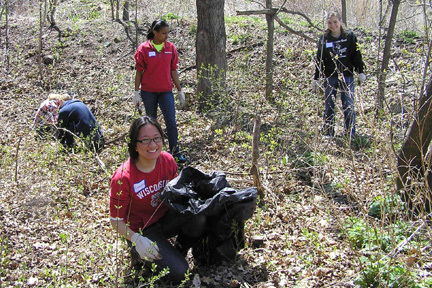 Student volunteers pull invasive garlic mustard plants. Photo by Bryn Scriver. The Lakeshore Nature Preserve benefits from the involvement of campus and community members! Volunteer your time to provide needed land stewardship. Check out our Events Calendar to find free nature walks and field trips sponsored by the Friends of the Lakeshore Nature Preserve. Join the Friends of the Lakeshore Nature Preserve or become an active member of one of our other Stakeholders and Partners. Donate funds necessary to maintain and restore the Preserve’s natural areas and provide ways for the public to enjoy them.